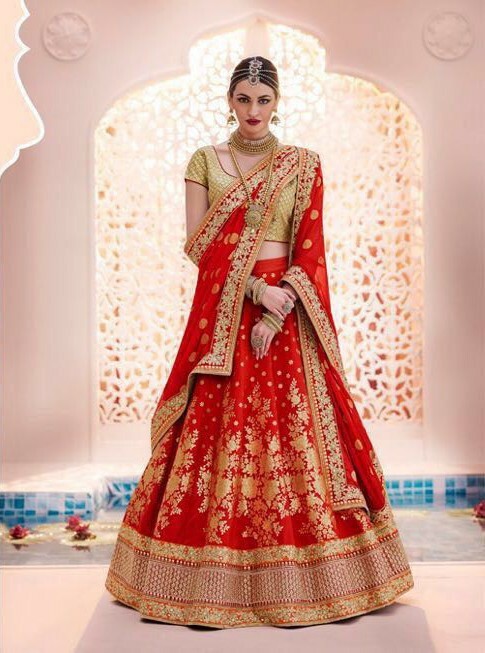 Red Bridal Lehenga never goes out of fashion. Red and golden combination is considered to be one of the most sacred colors for a bride when we talk about an Indian bride. There many Indian brides who want to wear a red lehenga rather than opting for a unique color lehenga on her wedding day so we keep you all updated about the latest bridal lehenga designs on our bridal blog. Well our today’s pick is a blood red lehenga with golden work which can be worn with a golden choli. We loved the light work on the lehenga that not only makes it look perfect on a bride but it is in itself of very light weight, making it very comfortable to the wearer. This kind of golden choli can work very well with your red lehenga or can go very well with any other color lehenga. If you are a bride to be then you can opt for this red lehenga on your wedding day. So girl’s do you find the red lehenga a beautiful one?